UT Home Secretary, Mr. Anil Kumar lighting the traditional lamp at the inauguration of ‘World Radiography Day’ at Law Bhawan, Sector-37, Chandigarh on Saturday, November 08, 2014. 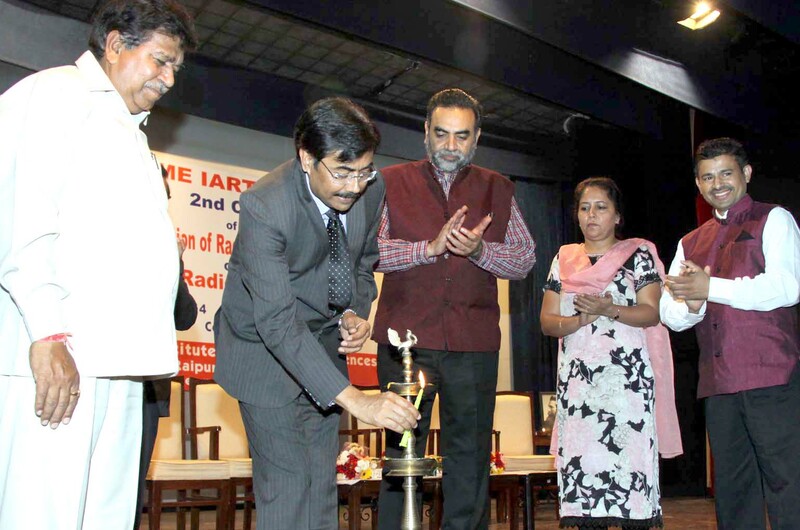 Chandigarh : 2ND consecutive CME-IART 2014 was held at LAW BHAWAN sector 37, Chandigarh and was organized by department of radiology GMCH -32 on November 8, 2014. It is the time of the year to proudly promote the great profession, by creating awareness throughout the larger community of the life changing roles involved in radiography. In honor of the anniversary of the discovery by WILHELM CORNARD ROENTGEN of X-rays in 1895. Not only on the day itself, but a day before, a dramatic play namely “Roentgen Ka Avtar” was performed by the passionate students of department of radio diagnosis at sector 17 Chandigarh. Students imitate different personalities and were successful in becoming the center of attraction and explaining the public the pros and cons of x-rays. The students took the road to spread the word about the profession and inspire the capital’s youngsters in considering it at future carrier. More than 350 delegates across north India participated actively and upgrade their knowledge and skills of ever changing medical technology. First prize for oral presentation was given to Mr. Manpreet from PGIMER followed by Ms. Niharika Chopra from GMCH -32. First prize for Poster competition was again shared by PGI, Chandigarh. Eminent speakers across north India shared their invaluable expertise in the field of radiology and imaging and radiotherapy. The Scientific Programme on latest Development in Imaging Modalities & Radiation safety was organized during the CME. Speakers delivered their talk & shared their experience with the Student Radiographers. Mohan Bhagwat, Assistant Professor Jamia Hamdard University, delivered his talk on Logical Radiography of Lumabar Spine.He explained the students how they can take good quality images by giving minimum radiation exposure to the patients. Sushil Battan from PGIMER explained the safety aspects in MRI and Role of Radiographer in it. Rahul Sally from Mumbai explained how the contrast injectors can improve the imaging quality and their use in different modalities serve in providing a good quality image. Rakesh Chaudhary from Delhi explained the importance of Radiation safety in hospitals. He explained various methods to detect the radiation hazards and importance of radiographer in controlling scattered radiation. Antriksh Singhal from Fujifilm, Gurgaon explained an overview on picture archiving computer system and role of radiographer in hospitals to handle PACS. Varun Upadhyay from Fujifilm explained Computed radiography System role in Radiography field and its importance over analog radiography. Lalit Gupta from PGIMER explained about the careers in radiography to the students participating in the conference. Jaspreet Kaur from G.M.C.H. gave a talk on role of radiographer in patient care and explained that we should give patient hearing to the patients because they need proper case and a good radiographer not only performs images but also reduces the radiation dose. Adarsh Sharma presented his talk on low dose imaging in C.T. to reduce radiation dose to the patients. Mr.Gyan Chand Gupta as Chief Guest along with Radiologists from GMCH including Dr. Suman Kocchar, Dr.Ravinder Kaur and Radiographic technologists namely Mr. laxmikant tewari ,Mr.Kashi Nath Yadav, Mr. Jaigopal Sharma all from GMCH & the invited delegates from all over the country were present. Dr. Suman Kocchar (Prof & Head : Dept. of Radio diagnosis, GMCH) in her speech stated the benefits of the x-rays as they are the pioneers in determination any pathology in human body. She also mentioned the importance of the radiographer who by giving the minimum dose to the patient provides a good quality X-ray which is foremost important for the treatment of the patient. She also said that on the flip side of the coin that the x-rays are being misused by people as they repeatedly command a patient to get his/her CT Scan or X-ray done, as the excessive usage of x-rays can reflect drastic results to mankind by causing deadly diseases like carcinomas ,infertility ,mental retardation and so on. Prof. N. Khandelwal (Prof & Head : Dept. of Radio diagnosis, PGIMER) stated in his talk that the primary role of radiographer is to produce a good quality image in order to diagnose the pathology of the patient by treating him on the means of least radiation dose. Prof. N. Khandelwal gave ample of examples of malpractices in which medical practitioners inspite being aware of the harmful effects of x-rays ,get a patients x-ray or CT done twice or thrice, this instead being diagnostic gets drastic. He also said that a radiographer is a back bone of Medical Profession who should have the knowledge how to use of art of technologies and also has full rights to question for the proper justification of examination which is to be done on any equipment. If not so a Radiographer can refuse to perform the exam. Dr.Ravinder Kaur shared that IART that is the INDIAN ASSOCIATION OF RADIOGRAPHER TECHNOLOGISTS should organize more CME’s in the state colleges to upgrade the knowledge of a radiographer so that they can contribute in a better way in patient care and also for the mashrooming of the profession so that the coming genera also adapts this as their future career. Last but not the least was the cultural program in which student showed their interest by giving their performances in means of dance and dramatic play from all over.